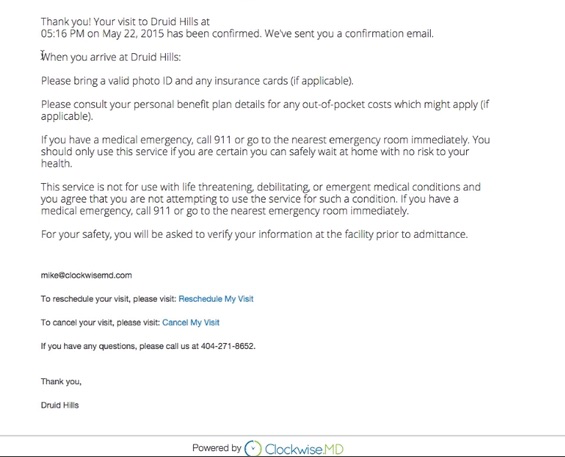 Clockwise – the Best Tool to Increase Patient Satisfaction? If the patient knows in advance how long they’ll be waiting and is prepared for that, they are much happier than if they thought they’d be seen right away and wind up waiting, even if the former is longer than the latter. They could call your center and ask the receptionist how long the wait is, and maybe that will be the case when they arrive, but then again, 4 more patients can walk in in front of them and add an hour to that expectation! Unfortunately, front desk staff’s estimates of wait time are notoriously inaccurate. Once the patient has proceeded through the clinical encounter there are any number of things that result in less than desired patient satisfaction. Maybe the overall visit took longer than expected, or the staff or providers were rude, the bathroom wasn’t clean, they didn’t get a full explanation of their condition or treatment, etc, etc. Most often you don’t know about any of these dissatisfactions except the really vocal ones that wind up on Facebook or Yelp, NOT with a good review or rating. That’s why I like Clockwise – meet expectations, provide a smoother workflow, and gather valuable feedback from patients to improve your services. I’ve used Clockwise for several clinics and on several websites. 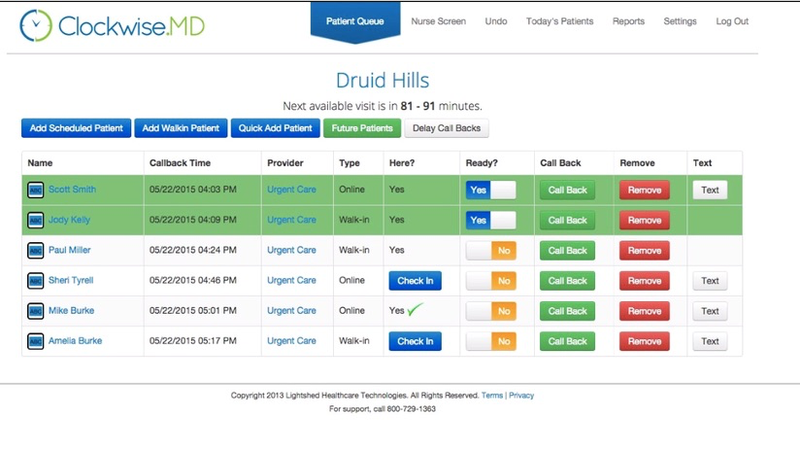 It works it’s magic on the front end part of the patient experience and has developed its solution around access to/waiting for care, the number one patient satisfaction issue in healthcare. 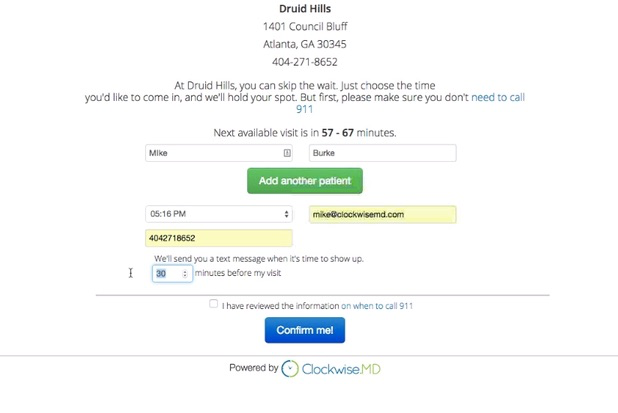 The Clockwise.MD product allows patients to reserve the next available spot on line from the web and skip the waiting room. It calculates expected wait time and sends reminders and updates via SMS, voice and email. It tracks and reports on lobby and exam room waits. 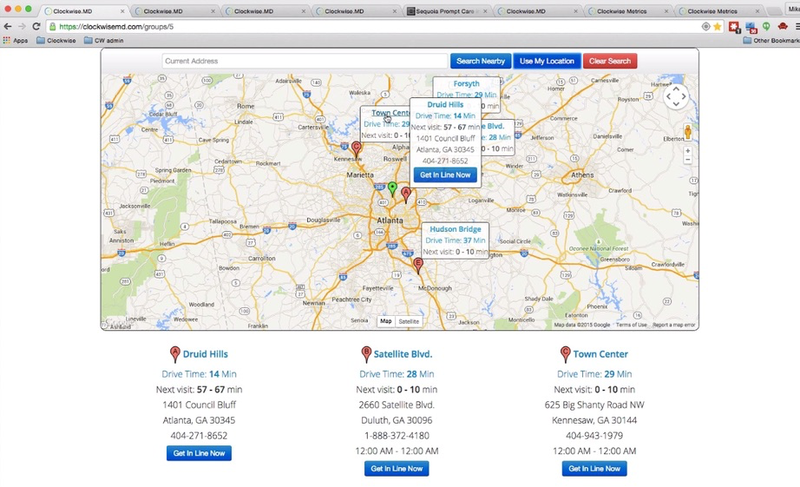 It integrates with EMR for appointment-based practices and with facility websites for promoting awareness and adoption. The patient queue and time-to-be-seen is shown on a flat screen in the waiting room, similar to the flight status screen at the airport. It makes me wince when I see these outdated websites that are basically just static billboards that list services, locations, phone number and maybe some other info about a practice. A practice website today should be informative, but also interactive and engaging. 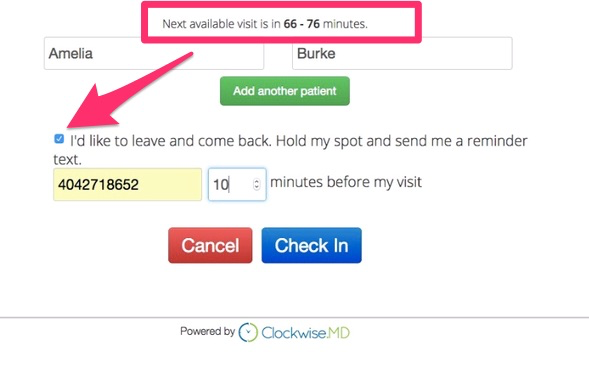 With Clockwise, when a patient arrives on your website, a link or button is prominently displayed on the homepage for them to “Skip the Wait” or “Get on Line Now”. This takes them to the Clockwise page, where it can show a map of one or more of your locations and the current wait times, and even the drive time from their current location. When they arrive at your center, they’ll see an LCD display on the wall that shows their first name, last initial and their callback time. On the way out of the office the patient is marked “discharged,” so now you have some valuable time stamps to assess overall wait times and throughput metrics. After the visit, every patient receives a text message to assess their satisfaction with the visit. It is based on the Net Promoter Score. Patients with a high score are sent a link to the review sites (Yelp, Vitals, Google+) and encouraged to leave a positive review, increasing your ratings on those sites. Real-time data on dissatisfied patients and basic issue tracking capabilities allow staff to address issues immediately. In one of their case studies Clockwise demonstrated a 50% conversion rate for web reservations, increasing online reservations by 200% over a 12 month period. They also found that more returning patients used the online reservation feature, and the center was able to smooth out peaks and valleys in the patient flow. This can help tremendously with staffing and actually reduce your highest expenses. For instance, if you’re in that awkward growth stage where by late morning it gets too busy for one provider to keep up without prolonging wait times, two problems are created. First you have a to hire a second provider. It’s not always easy to get someone to come in just for those 2-3 hours of “rush” time, so you have the expense of adding at least 4-6 hours of provider payroll per day. Second, you find they are not fully utilized in the mid afternoon when flow tends to slow down. With Clockwise, you may be able to queue those late morning patients to come in later, smooth out that flow and keep it to the one provider. Another option is to open up more “queue-able” slots when the second provider is on duty to fill their capacity more efficiently. 90% of online patients said the reservation feature influenced their decision to choose this practice. 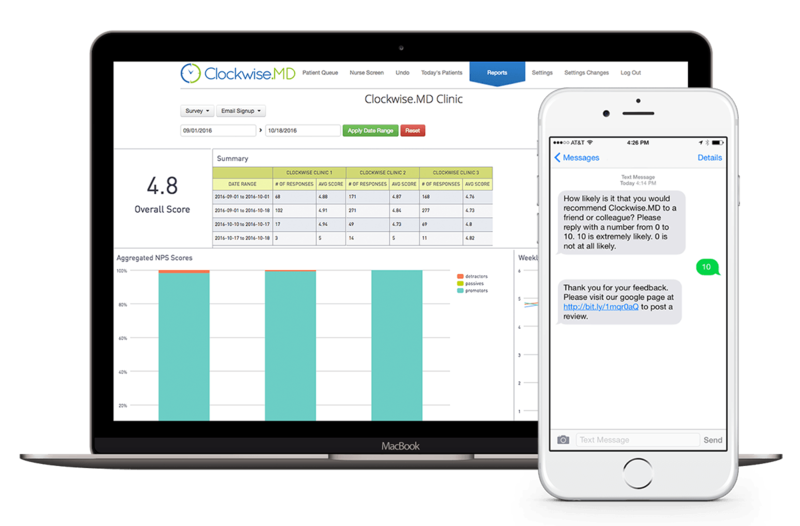 At CEP America’s Samaritan Medical Care Center, Clockwise survey has generated a 40% response rate with 73% of patients replying within 2 hours of receiving the SMS-based survey. 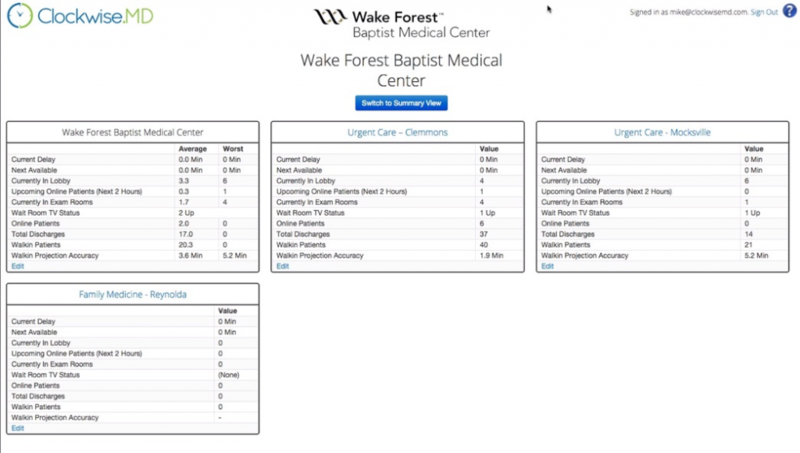 The robust reporting engine in Clockwise allows you to draw comparisons between patient satisfaction scores and wait times, exam room waits, and even the staff members who come in contact with patients throughout the different steps in your workflow. Here’s an example of an automated patient satisfaction report that is deployed to staff members on a daily basis. Pricing is based on monthly volume, and comes with a return-on-investment guarantee: Clockwise will generate at least 4 times its monthly cost in patients new to the practice that come in through the online reservation channel. Price quotes are available upon request. This service is very affordable, and the return on investment, as indicated above, is phenomenal. Clockwise provides a great service for any healthcare workflow including ED, Urgent Care, Labs and Primary/Specialty Care. I loved when you mentioned how you should call ahead of time to make sure you know how long you’ll need to wait. It makes sense to think that doing this can help you save a ton of time and get the type of care you need. As I see it, taking the time to compare several urgent care providers can help you choose the most convenient one for you.